Despite service that 'sucked,' an Iowa couple leaves a $100 tip for the waiter to prove a point about the life of a waiter in America. Despite a dining experience that "sucked," the couple left a $100 tip for the server on a bill of $66.65 to emphasize they knew it wasn't his fault. "We've both been in your shoes. 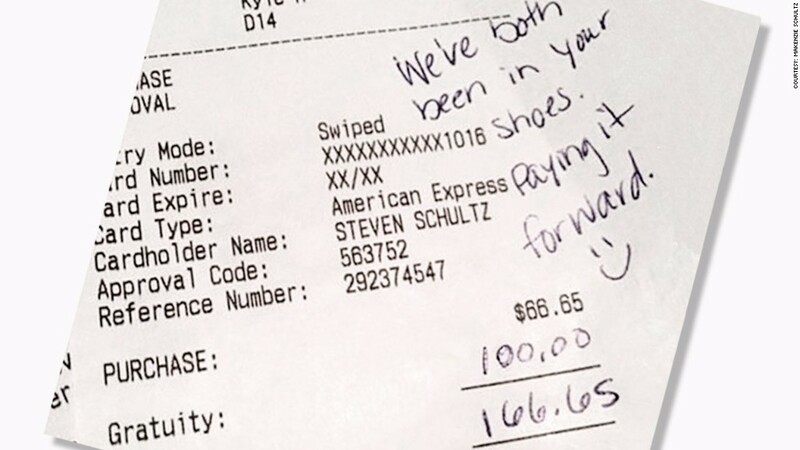 Paying it forward," Makenzie wrote on the receipt. She later shared a photo of the bill on Facebook (FB) with a post that concluded: "I'm just sharing this as a friendly reminder to think of the entire situation before you judge. And always always always remember where you came from." The post has gone viral with over a million "likes" and 150,000 shares. She only intended it for family and friends and has been astonished at the reception. Just how terrible was the meal? It "took 20 minutes to get water, 40 minutes for an appetizer and over an hour for an entree," Makenzie said in the Facebook post. She also told CNNMoney that one couple actually walked out of the restaurant and another ran up to the hostess booth to warn a friend not to eat there. But the Schultzes looked around the restaurant and realized something: There was only one waiter serving 12 tables, and he was doubling as the bartender too. Makenzie and Steven have had those kind of nights. They met when they were both waiters at the Bubba Gump Shrimp Co. in the Mall of America in Minnesota. They know that sometimes the kitchen messes up or someone calls in sick and it's not the waiter's fault, but guests still blame the server, often leaving horrible tips. "Steven and I agreed it would feel good to make this guy's night when he would probably be getting minimal to no tips due to slow service," she wrote in the Facebook post that displayed the bill (but omitted the name of the restaurant). The tip worked out to 150%, a heck of a lot bigger than the usual 15% to 20% most Americans leave. CNNMoney confirmed the huge tip with the restaurant, which said they planned to add more waiters and that someone had called in sick Saturday and they couldn't find a replacement. The Schultz family has heard from hundreds of people, most complimenting them or sharing similarly inspiring stories. "I hope people just show more compassion for everybody," Makenzie said. "If you can give little or give big, I think everybody's world would be a little kinder, gentler and nicer."